Late to the table: Which Asian nations are going hungry at the feast? Asia is undoubtedly one of the most important markets due to its position as the industry’s driver, and the core markets within the continent, such as Malaysia, Indonesia, Brunei, Singapore and Sri Lanka. With its natural disposition for Islamic finance due to its population demographic, and the right talent, these countries are expected to continue attracting Shariah compliant investments and funds; and inevitably become market leaders with continued regulatory support and proper infrastructure development. 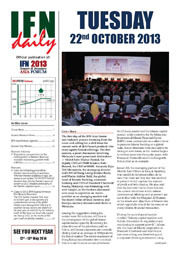 The IFN Asia Forum remains our flagship event. Currently the most liquid and resource-rich market, Asia has become the focal point for investors looking to escape the financial drubbing experienced by western markets. Perhaps the key to Asia’s popularity is its status as an emerging market, which directly implies a gamut of untapped investment opportunities for development and capital requirement to serve its growing population. With its natural disposition for Islamic finance due to its population demographic, countries such as Malaysia, Indonesia, Singapore, Hong Kong and Brunei are expected to continue attracting Shariah compliant investments and funds; and inevitably become market leaders in the area with continued regulatory support and proper infrastructure development. The growth figures for Asia are staggering, and nothing less than impressive. Southeast Asia alone is expected to grow at an average of 5.6% in 2012, up from 5.3% in 2011, while intra-trade between South Asia and the Middle East has seen a hike to 11% over the last year, and is expected to remain on an upward trajectory; all this amid the cacophony in the global financial markets. However, Asia’s position as an emerging market also places it in a Catch-22 situation; while growth is hard to be ignored, risk is equally high, and an unfamiliarity among the global financial community with the business dealings within Asia and a perceived disparity in business cultures and norms has somewhat created trepidation among investors looking to park their money in what seems to be the world’s most bustling region in terms of growth and issuer activity. In terms of Islamic finance, market players are confident of key areas within Asia such as project and infrastructure financing, development of soft sectors such as IT and healthcare, and wealth management to name a few. And many are restless for the Islamic finance community to focus on this emerging market and tap the existing growth opportunities to further boost the industry’s position; and perhaps to some degree popularity, among the general investment community. Should Islamic finance successfully work in tandem with Asia’s growth story, there is no doubt that the market will eventually achieve what it has always sought – the elusive question of critical mass and secondary market deepening. IFN Asia Issuers & Investors Forum will take you around Asia and explore these growth opportunities, question Asia’s exhibited resilience towards the world’s current financial woes, investor appetite for Asian-based investments and of course, their concerns. 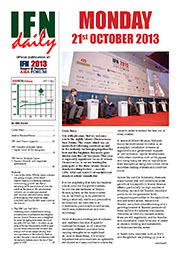 Through a series of exclusive regulatory country presentations, practitioner-led round-table discussions, non-debatable power presentations, original case studies and sector focused side sessions, the IFN Asia Forum in 2013 will again be the key, must-attend industry event for issuers, investors, regulators and all financial intermediaries involved in the Islamic financial markets with the slightest interest in the Asian markets. With the proper implementation of regulations and the provision of sufficient infrastructure, the capital markets of Asia will continue to thrive and attract liquidity from all over the world. From being an exotic market with immense growth potential, Asia is now in the driving seat to become the world’s new economic giants.